Cardholders are perfect for people who need to carry just a few cards and banks notes because they are so compact and easy to tote. Ideal for those nights out where you don't want to be packing your full wallet. Give it a night off and leave it on the dresser. All models are in stock. Steel cardholders are simple to open and close, they measure about 9.5cm x 6cm x 0,7cm so their capacity is limited to 5 or 6 cards only. All of the steel cardholders we carry are made of 304L stainless steel and some models are lined with black felt. Those models are popular for people who have fancy business cards. Strong protection for your cards. Can carry anything smaller than 6 credit cards. Can become scratched with abuse. A leather card holder is typically 10x6cm and may have some have exterior card sleeves. Leather does expand a bit, so you can carry more cards than there are slots. At Trendhim we also have slightly larger cardholder models with room for notes and coins. Leather is pliable subjecting your cards to damage. Cannot carry coins but can tote notes. Cardholders are now being created in wood, plastic, felt and cork. At Trendhim we sell wood and cork models. Exentri is an exciting Norwegian brand and we sell their popular models in different colours. 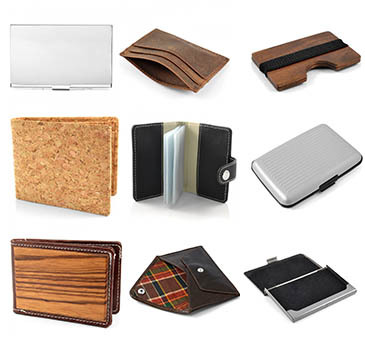 They make wallet and cardholder hybrids that are very creative in their design.